The versatile Acroprint ES700 Atomic Time Recorder and time stamp can be used to support time and attendance, job costing, and document control and is designed for a professional office environment. The ES700 time recorder synchronizes automatically with time codes transmitted by the National Institute of Standards and Technology, keeping it incredibly accurate. The internal battery backup keeps the clock on time, even during power outages. With over 150 possible print configurations and 13 preset messages in your choice of four languages, the ES700 easily supports a wide variety of time & attendance and document control applications. 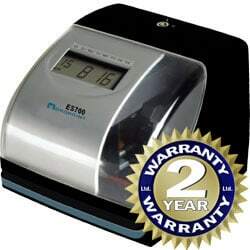 This time stamp accomodates virtually any time card, document or form, offering adjustable print font size, your choice of automatic, semi-automatic or manual print operation, and left or right hand print. The power supply is switchable from 120V to 240V. Time synchronized with time codes transmitted by NIST means no more resetting. Internal battery backup maintains time even during power outages. Automatic date advance and Daylight Saving Time adjustments save you time. Date, time and day of week displayed on a large, easy-to-read LCD display. Clear window and bright internal LED make document alignment a breeze. Automatic, semi-automatic or manual print operations. Accommodates right or left-hand time cards. Selectable hour format (12 or 24). Standard minutes, tenths, hundredths or seconds. 13 preset messages (RCVD, SENT, IN, OUT, CFMD, FILED, PAID, USED, FAXED, VOID, ORIGIN, APR’D, CMPL’D) in your choice of English, Spanish, French or Portuguese. UL-approved switchable 120V/240V power supply.